Dave Steppe, a lieutenant with the Blue Angels, is a back-seater on the Number 7 jet during shows. 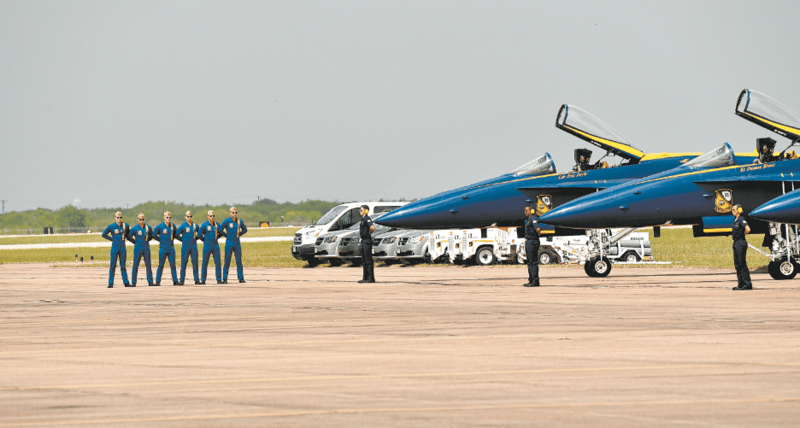 He’s shown above with members of his squadron at the Wings Over South Texas Air Show – NAS Kingsville, TX on Saturday, March 24, 2018. 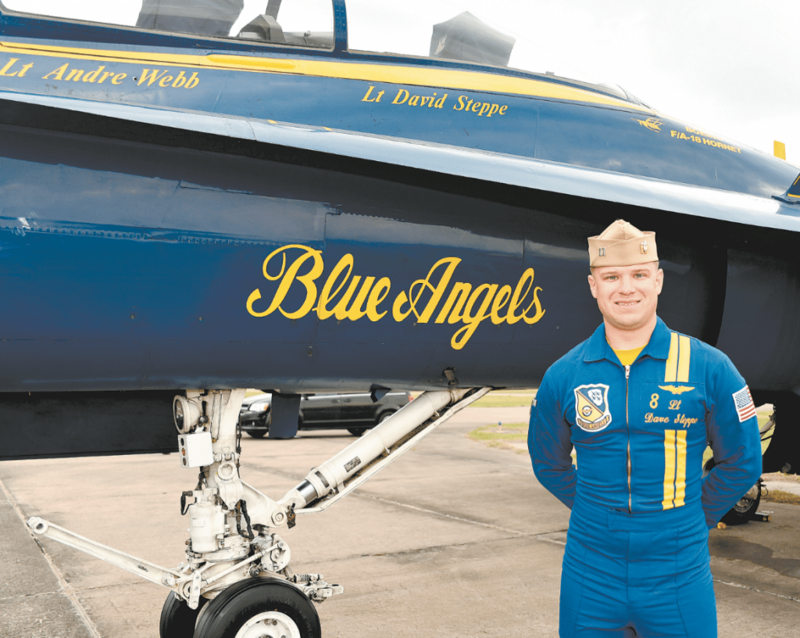 Steppe, 32, will be making a homecoming, of sorts, when the Blue Angels perform during the Tuscaloosa Regional Air Show April 14-15. Journal photos by Lee Walls Jr.
STORY BY RUBIN E. GRANT | PHOTOS BY LEE WALLS JR.
Dave Steppe’s young son, Wyatt, doesn’t understand what his dad does for a living. But whenever 1-year-old Wyatt sees his dad in uniform, he gets excited. So do a lot of other folks who attend one of the U.S. Navy Blue Angels’ air shows. Steppe is from Vestavia Hills and is a lieutenant with the Blue Angels, having joined the U.S. Navy flight demonstration squadron in 2016. 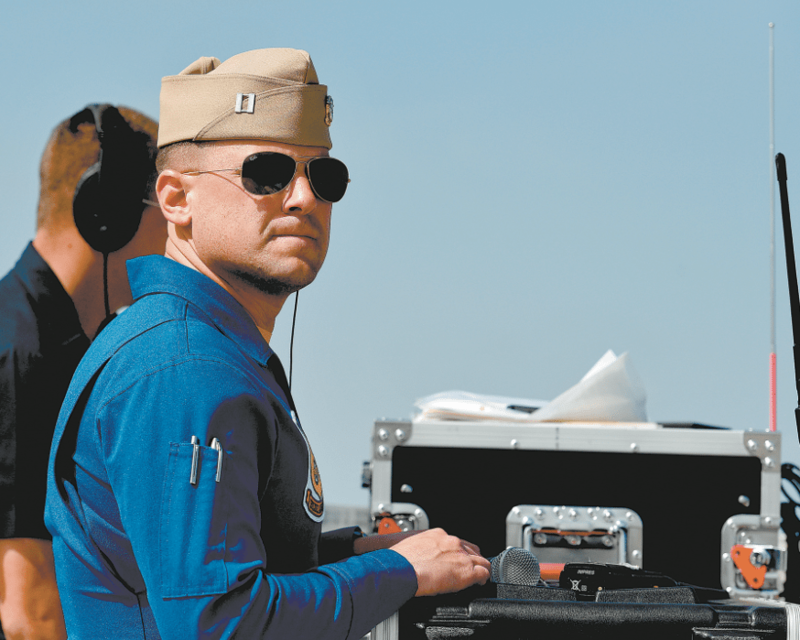 He was named the squadron’s events coordinator for the 2018 air show season. Steppe, 32, will be making a homecoming, of sorts, when the Blue Angels perform during the Tuscaloosa Regional Air Show April 14-15. Of course, Wyatt will be there along with Steppe’s wife of nine years, Alana, who’s from Dothan. Some of the Blue Angels can’t wait to land in Tuscaloosa. “We have a few guys who are big Alabama football fans, so they’re super excited,” Steppe said. Steppe himself is an Auburn University alumnus. He attended Vestavia Hills High School and played football for legendary Rebels coach Buddy Anderson. “I learned so much playing for coach Anderson, how to become a leader and a better person,” Steppe said. Steppe played wide receiver and was a kicker for the Rebels. He had a few scholarship offers from minor schools, but a knee injury prevented him from playing college football. After graduating from Vestavia Hills in 2004, Steppe went to Auburn. He graduated in 2008 with a bachelor’s in logistics through the Naval Reserve Officers Training Corps and was commissioned an ensign in the Navy. He eventually reported for officers’ flight training school and received his wings of gold in 2010. He applied for the Blue Angels in 2016 and joined the squadron in September that year. The Blue Angels consists of 130 active-duty sailors and Marines and is in its 72nd year of showcasing the power of naval aviation. 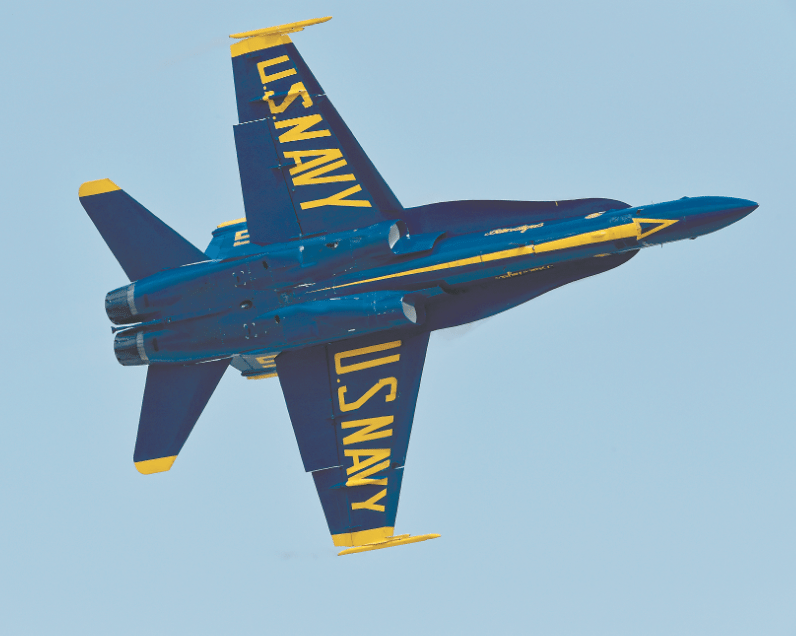 During the air show season, the team is stationed at Forrest Sherman Field, Naval Air Station Pensacola, in Florida. The squadron spends January through March training at the Naval Air Facility El Centro, in California. 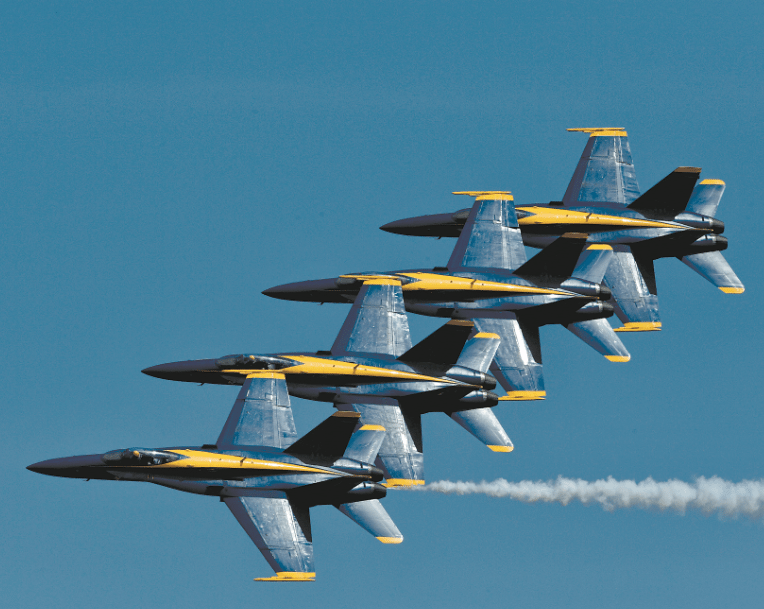 When not traveling with the Blue Angels, Steppe is stationed at Naval Air Station Whidbey Island in Washington. Steppe is a back-seater on the Number 7 jet during shows. He has accumulated more than 1,400 flight hours and has more than 300 carrier-arrested landings. His decorations include a Navy and Marine Corps Achievement Medal as well as personal and unit awards. He served in Iraq and on an aircraft carrier in Japan, which traveled the Pacific, doing exercises in Korea, China and Australia. Steppe visited Tuscaloosa in November with another Blue Angels lieutenant, arriving at a private hangar at the Tuscaloosa Regional Airport in the Blue Angels’ signature blue and yellow McDonnell Douglas F/A-18 Hornet. It is the fighter jet that the squadron’s pilots fly in their demonstrations across the nation. “We just made a pre-site visit, informing them what we need from the community and what the Federal Aviation Administration requires, so everything will be safe,” Steppe said. The Blue Angels will perform at more than 30 locations in 2018. Their show this month will mark the fifth time the Blue Angels have performed over Tuscaloosa since 2009. 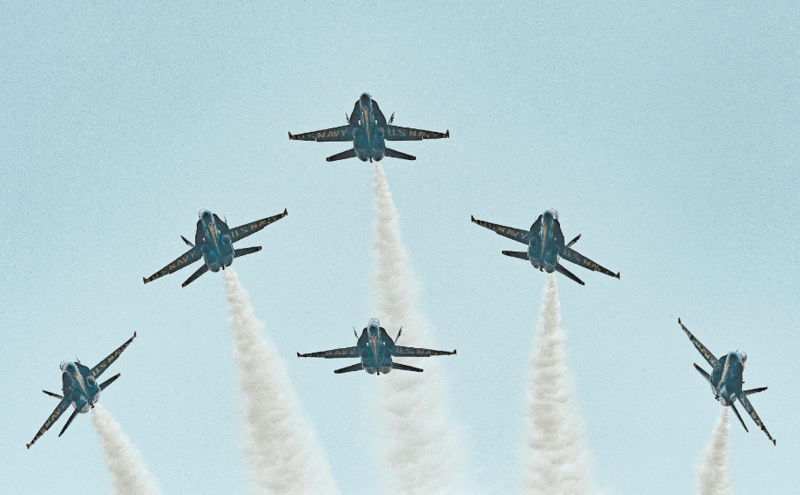 According to Steppe, the Blue Angels perform for two basic reasons: to showcase the pride and professionalism of the U.S. Navy and Marine Corps and as a recruitment tool to attract young men and women to the Navy and Marines. Since its inception in 1946, the team has flown for more than 450 million spectators worldwide. Steppe said the Tuscaloosa show will feature 60 pilots. Among the demonstrations that will be performed is the diamond, with jets flying in a tight formation and displaying precision. There also will be the max performance, which demonstrates the power of the Delta jets. “What people are going to see is an awesome demonstration of the teamwork of our pilots,” Steppe said.